SOF is a Registered Not-For-Profit Organization Popularising Computer, Science, Mathematics and English Education among school children. In the present times when the world is totally pivoted on science and IT, it is pertinent to think and plan about the future - a future in which the children of the present shall be the leaders of tomorrow. Regular qualitative and quantitative assessment needs to be done at the national level in order to build up the scientific and IT talent pool. It is in this sphere that the role of SOF has been much appreciated over these last few years, so much so that highly reputed organizations like WIPRO, LG, Reliance, Aakash Institute, Vidyalankar Dnyanapeeth Trust, Resonance and MTG Learning Media have volunteered to support SOF's various programmes. SOF's integrity and commitment towards the fulfillment of its objectives have been lauded by thousand of schooling institutions and millions of students who have directly benefited from its educative, informative and evaluative programmes. For the future SOF has several more innovative programmes lined up, which promise to bring about a sea change in the approach to science, maths and computer education. 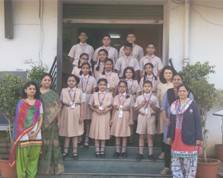 Students actively and enthusiastically take part in NSO, IMO & IEO conducted in the school and have won great accolades by reaching the State and National Level.